Oregon State University Press, 9780870719240, 216pp. Most of us wouldn’t think to look for penguins in a hot desert, but every year along a windswept edge of coastal Patagonia, hundreds of thousands of Magellanic penguins gather to rear their young at Punta Tombo, Argentina. It is the largest penguin colony in the world outside of Antarctica, and for the past three decades, biologist Dee Boersma has followed them there. 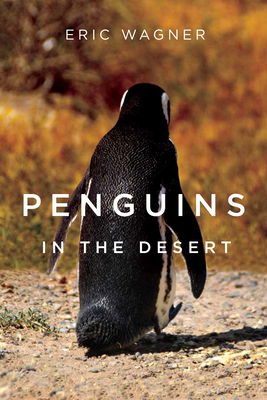 Eric Wagner joined her team for six months in 2008, and in Penguins in the Desert, he chronicles that season in the remarkable lives of both the Magellanic penguins of Punta Tombo and the scientists who track their every move. For Boersma, the penguins are ecosystem sentinels. At the colony’s peak, more than a million birds bred there, but now less than half as many do. In confronting this fact, Boersma tackles some of the most urgent issues facing penguins and people today. What is the best way to manage our growing appetite for fish? How do we stop catastrophic oil spills from coating birds? How will we address the looming effects of climate change? As Wagner spends more and more time with the penguins and the scientists in the field, other equally pressing questions come to mind. What is it like to be beaten by a penguin? Or bitten by one? How can a person be so dirty for so many months on end? In a tale that is as much about life in the field as it is about one of the most charismatic creatures on earth, Wagner brings humor, warmth, and hard-won insight as he tries to find the answer to what turns out to be the most pressing question of all: What does it mean to know an animal and to grapple with the consequences of that knowing? ERIC WAGNER lives in Seattle with his family. He is the author of Once and Future River, and his essays and journalism have appeared in Orion, Audubon, Smithsonian, and High Country News, among other publications. He earned a PhD in biology from the University of Washington for his work on the Magellanic penguins at Punta Tombo, Argentina.